The Heil HS-2 Handswitch was designed to ergonomically fit your hand naturally and comfortably for long communications with no fatigue. Activating it is just like a pistol trigger with the index finger. 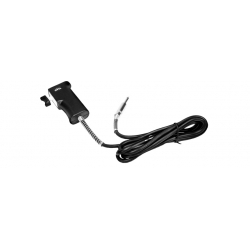 The ergonomic design features a very light touch trigger switch that is a reliable 15 amp microswitch. Interfacing with your equipment is through a 6 foot cable terminating in a metal 1/4" mono plug that mates to the 1/4" jack on Heil's mic and headset adapters.